And recognises that different representations of a design are needed to articulate certain elements of the design, while ignoring others. It sees design as a conscious process which involves a dialogue both with and about the materials. It is seen as a creative and communicative process and an essentially social activity. When asked the question ‘what do you need in order to make better use of new technologies in your teaching?’ teachers invariably say they want examples and they want to be able to share and discuss their ideas with others. 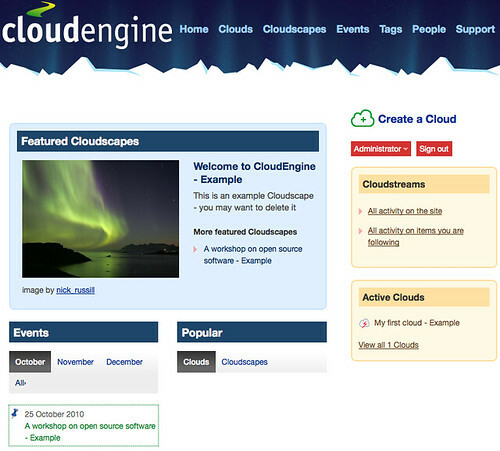 CloudEngine is the software that powers Cloudworks and has been released on an OpenSource licence. Internationalized – currently in English and Greek! CloudEngine uses PHP 5 and a MySQL database. It is built on the CodeIgniter framework – lightweight, easy to learn. It prefers Apache and mod_rewrite. Includes jQuery and the Tiny MCE editor. Many features (API, internationalization, moderation…) can be switched on/off and configured. Built with accessibility & standards in mind.